Could have been add-on to fit the page. Like they added the blurb. I think you’re missing the point, though. The actual original Ditko cover survived, otherwise they couldn’t have reprinted it in the 80’s or used it as a variant cover. Whether the one I posted is it, or not, is beside the point. It exists. No. It "existed" and somebody made a copy of it. "When", "where", "why" are not answered by that sole fact. And there's nothing else, so far, proving any other fact. Maybe. Or maybe an image of it exists. No chance. Show me another early SA marvel cover (hero or pre-hero) with the thick word bubble outline where they cropped the word bubble. Just didn't happen. This was an unused cover. Maybe that’s part of why Stan rejected it? Don't be ridiculous. C'mon now They had been using that thick word bubble technique for years before amazing fantasy 15. No professional artist is going to make that mistake. They always left a bit of room. This image here is cropped and there is still rooom.. I get wanting the art to exist. And maybe it does. But that Sean Howe picture is 100% not it. Why would an image of an unused cover from that era still exist? Obviously, printed comic books, unlike OA, can be off center. The logo is cut off on that one as well, telling me that the "space" is wrapped onto the back cover. A properly centered copy (most copies aren't) has room. Not a lot, but its there. Its actually easier to see on this reprint. Maybe a stat exists right? Would that be so crazy? No crazier than the original existing. So before, the lack of space to the left on the "OA" was to you a sign it might be rejected. Then, you use the published cover (off-center) as some kind of indication that the word bubbles were cut off on the OA. Well if the word bubbles were cut off on the published OA, why TF wasn't it rejected then, according to your own logic? Like I said, maybe the rejected art exists, maybe it doesn't, but the pic shown is a fake, flat out. Because they kept a stat of it the way they kept stats of the unused FF Annual 1, FF 3, ASM 10, etc. They reprinted the AF 15 (unused) stat in the 50 Years of Marvel book. The OA isn't known to exist. I interviewed the guys who ran the printing presses in the 1960s. That cover art isn't under Stan's bed. It's either a) under someone else's bed or b) put into a landfill in 1964 to make more room on the shelves. "under someone else's bed" is what I think. Well, there was the saying about, 'Reds under the beds'. I'll check for those pesky Reds later on when I head off to the land of Morpheus. I doubt that I'll find any unused Ditko covers. Ah. So no evidence needed, just a matter of faith for you. Kinda like Jesus or or something. Cool. This fascinating post by Irene Vartanoff on her blog sheds some light on the subject. She thinks there may still be some photo negatives of the original cover art out there, at least. Irene also takes issue with Glen Gold’s claim that her Marvel art inventory list wasn’t accurate. Glen, you are one of the few people on this thread who has done any actual research, so I don't mean any disrespect, but how do the pressmen know that Stan didn't end up with the covers? Does that mean the covers were sitting around the printing plant, no one from Marvel ever came around for them, and so the "someone else" is the janitor or something? I hate to use logic, but why would they make a “stat” of the covers but not the interiors? 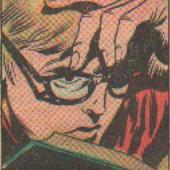 Why keep the interiors for “reprints,” then make a stat of covers you don’t ever intend to reprint. Irene Vartanoff says they were making photo negatives of the covers and archiving those (at least one person was). But where were the originals? If you can use the photo negatives or stats to make printing plates, why even send the original covers to the printer at all? 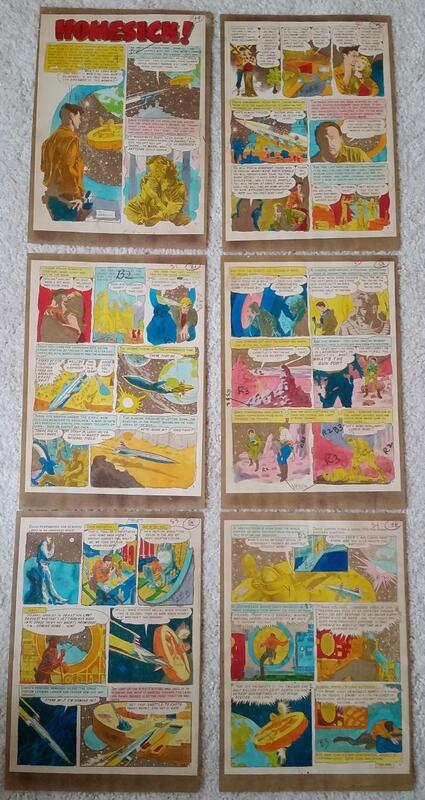 Lots of Marie Severin color guides exist from the EC comic-books. Basically stats of the art colored as a guide for the engraver (note that these are interior pages) These things were saved because publisher Bill Gaines archived all the original artwork and by-products.